Short-cycle projects are an undervalued feature of the shale revolution. The power of shale extraction is that capital spend is spread out and cash returns come sooner. North America, which offers substantial short-cycle opportunities, continues to draw investment as exhibited by the recent acquisition of Anadarko (APC) by Chevron (CVX). The CVX/APX deal is great news for midstream energy infrastructure. 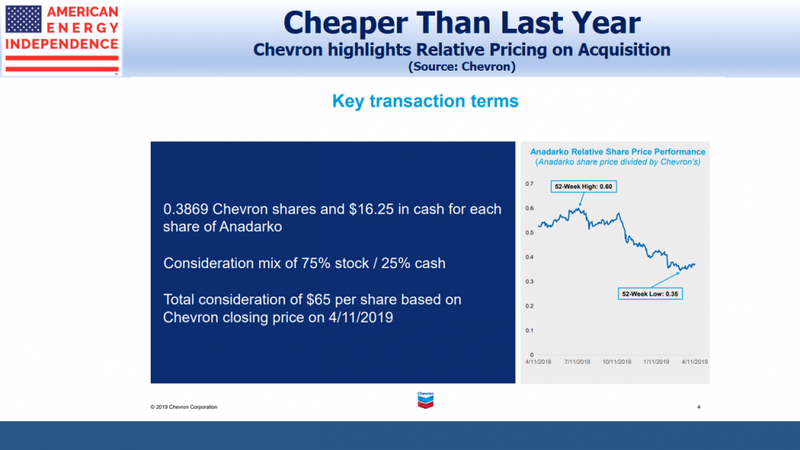 Chevron (CVX) CEO Mike Wirth must have used the term “short-cycle” at least half a dozen times on Friday’s conference call discussing their $33BN acquisition of Anadarko (APC). It’s a feature of the shale revolution that’s still unappreciated by investors, even while it’s highly valued by upstream companies. A faster capital cycle boosts returns. The U.S. shale revolution has upended global energy markets, and not only because of cheap, new supply. 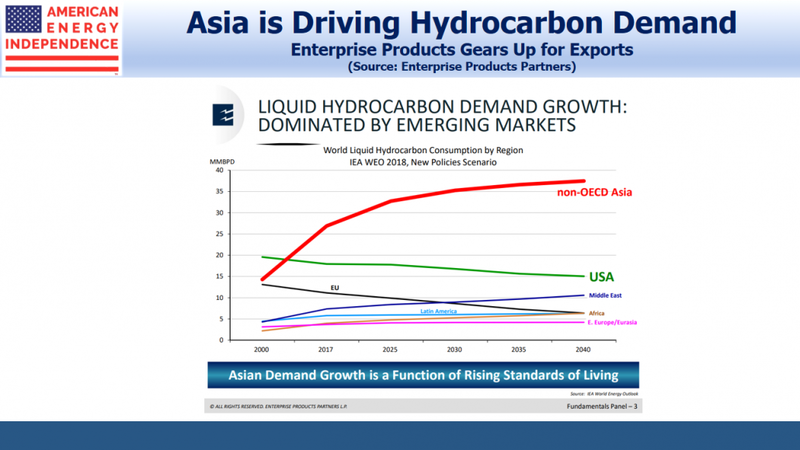 which is already turning America in to the world’s biggest exporter of hydrocarbons. A decade ago Cheniere (LNG) was building facilities to import natural gas, and energy independence was a pipedream. Conventional oil and gas projects used to require many billions of dollars in upfront capital, with a payback over a decade or more. Global GDP growth, production costs and future demand all have to be considered before a final investment decision is made. Climate change and public policy response have added to long term uncertainty for an already cyclical business. The power of shale extraction is that capital spend is spread out and cash returns come sooner. It costs less than $10 million to drill a well, and in America we drill thousands every year. The high initial production and sharp decline rates return capital invested far more quickly. Output can be hedged because the two- to three-year liquidity of futures aligns with the cashflow cycle of shale far better than with conventional projects. If oil falls, drilling slows. It’s just less risky, which is why investment dollars continue to flow into North America. CVX isn’t alone in recognizing this. ConocoPhillips (COP) places U.S. unconventional, or tight (as shale is often called) in the upper right of a chart with the best combination of capital flexibility and returns. 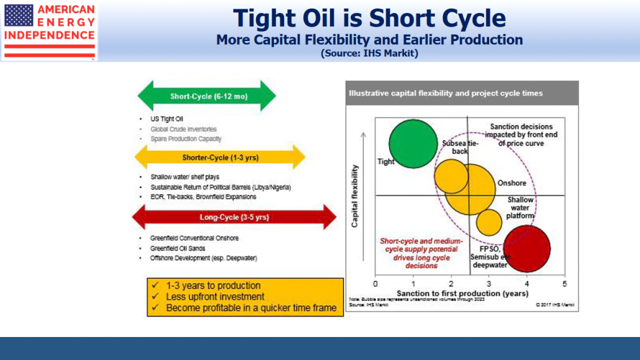 This chart from IHS Markit links high capital flexibility with fast initial production. We have often commented on this aspect of growing domestic oil and gas output. See our short video America’s Energy Renaissance: The Short Cycle Advantage of Shale and a piece in Forbes The Short Cycle Advantage Of Shale. Conventional projects are becoming much smaller. North America, which offers substantial short cycle opportunities, continues to draw investment. The result is that America is gaining share in the world’s energy markets. This is likely to remain the case in almost any scenario, because of shale’s lower risk profile. 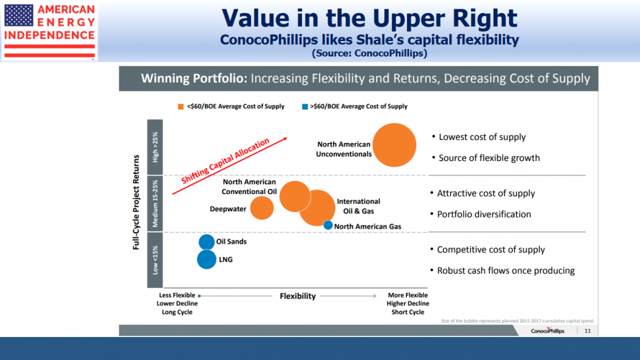 Wirth went so far as to highlight that not only is shale among some of the highest return projects in their portfolio, but it’s also among the lowest risk both below and above the ground. A slide from Enterprise Products Partners’ recent investor day highlights strong growth in Asia over the next couple of decades. For pipeline owners, this is enormously positive. North American upstream companies are our customers. The shale revolution has plenty of critics who argue that Wall Street continues to provide capital, illogically, to unprofitable activities. And yet well informed investors such as CVX are concluding it’s a very attractive place to be. Last year ExxonMobil (XOM) announced plans to invest $50 billion in North America over the next five years. CVX was already planning 900,000 barrels a day of oil production by 2023 in the Permian before the APC acquisition. XOM expects to produce a million barrels per day there. These companies bring scale and stability, which makes them the most attractive customers possible for midstream energy infrastructure. This was also positive for Western Midstream Partners (WES), since their business with APC is now likely to grow substantially. In response to a question about its new MLP, Wirth pointed to the Waha basis spread, which is negative, meaning producers are paying to get rid of their natural gas. He noted the importance of offtake and high quality midstream infrastructure, and clarified that WES was a strategic asset for them. CVX is taking advantage of relative weakness in APC’s stock price compared with their own. Nine months ago they would have had to offer almost twice as big a premium. There were also reports that Occidental Petroleum (OXY) had offered APC $5 per share more, but that CVX’s offer was preferred because it’s regarded as a better partner. The bottom line is that the CVX/APC deal is great news for midstream energy infrastructure. CVX’s lower cost of capital and merger synergies can only lead to higher oil and gas production than would otherwise have been the case. Pipeline stocks are poised for a significant rally. Over four years of weakness have led to distributable cash flow yields above 10% that are growing 10-15%. Dividends are rising for the first time since 2014. The sector remains over 30% below its all-time high, even while the S&P 500 flirts with a new record. CVX provided further affirmation of the enduring value in U.S. unconventional production. Disclosure: I am/we are long EPD, WES. I wrote this article myself, and it expresses my own opinions. I am not receiving compensation for it. I have no business relationship with any company whose stock is mentioned in this article.